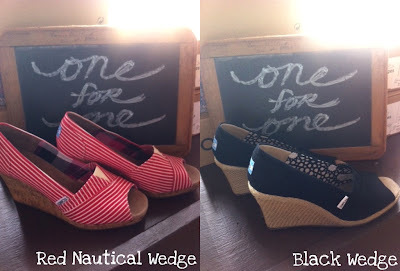 Horseshoe Boutique: Toms! Toms! Toms! The little Horseshoe window has been taken over! ..By TOMS that is. The wait is over, ladies, they're here! We are so proud to represent this incredible company, and even more proud to wear them on our feet! "In 2006, American traveler Blake Mycoskie befriended children in Argentina and found they had no shoes to protect their feet. Wanting to help, he created TOMS, a company that would match every pair of shoes purchased with a pair of new shoes given to a child in need. One for One. Blake returned to Argentina with a group of family, friends and staff later that year with 10,000 pairs of shoes made possible by TOMS customers." Come and get yourself a pair of stylin' new kicks to start off your Summer right. Don't forget to mark your Calendar for June 15th, come on down to Horseshoe for the Style Your Sole event from 5-9. You'll even get to take 20% off your purchase of TOMS in natural or white to paint and decorate.